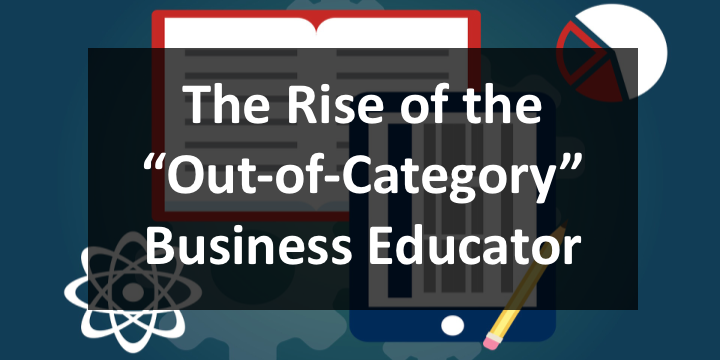 Eduvantis has been keeping a close eye on what will continue to be an increasingly important factor in the life of traditional business schools: out-of-category providers. Published data, our internal analysis and experience talking with experts across the market suggests that traditional, university-based providers of executive education are losing market share to an increasingly diverse set of “out of category” providers – eConsulting firms, educational technology companies and other “non-academic” providers of knowledge capital are providing training and leadership development to companies and individuals. Explaining the full set of reasons behind this development, of course, is a long, complex story. But the core narrative is that technology has enabled nearly any entity that owns knowledge capital and information of interest can get into the executive education (credit, non-credit, certificate) game – either selling their wares “face to face” or through a variety of increasingly sophisticated online platforms that can help deliver their products at scale. Of course, this emerging breed of “out of category” players has the same challenges of finding, selling to, serving and satisfying customers at levels that support an “executive education” product model. That’s yet another story. In any case, we are convinced, based on a deep look at this subject that traditional business schools must take heed of what is happening – and determine how they might best strategically engage in this new environment – either through the delivery of new products of their own or through deep, non-redundant partnerships with new, right-fit out of category partners. If you would like to discuss this issue, email us at tim@eduvantis.com.